Description: CN 5738 and an NS Unit pull a westbound freight over Seminary Street in Charlotte. I was very surprised to hear a Leslie S3K Horn on the 5738, instead of the Usual Airchime K3H Horn. Description: Westbound stacker aproaches Ashcroft, B.C. 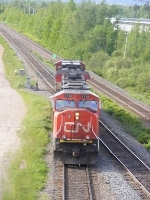 Description: CN train from Port Huron blurs by (Literally!) at Durand Station.